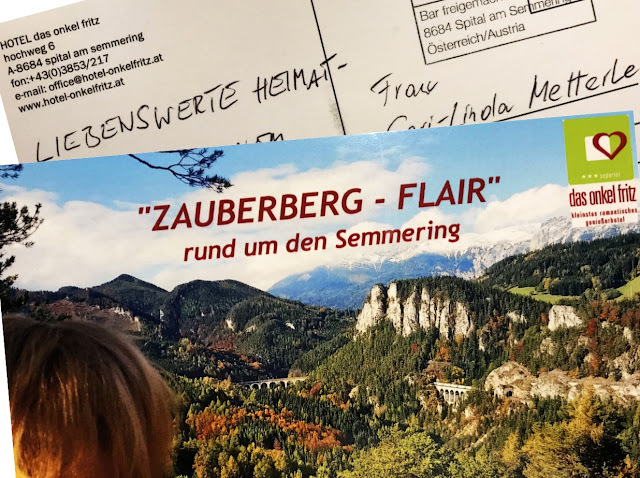 That is our favorite little hotel in Styria, Austria: das onkel fritz am Semmering, in the neighborhood of the UNESCO World Heritage, Semmering Railway. Specially created for #LinkingPostcards this wonderful scene from the Magic Mountain along the Semmering Railway. This place is on the favorite hiking tour of the Rottenschlager Family, who own our favorite little romantic hotel, and take every spare minute to get out into nature. The motive on the #LinkingPostcard used to be once on the reverse of a 20 Schilling bill (Austrian official currency before the Euro) - see left hand side picture. I selected this card to send to them, because of the tranquility that spreads from this sunset, knowing both of them are very busy with their hotel. So maybe a glimpse on the card, gets them to relax and dream away, just for a few minutes. Thank you so much Leo Deegan, that was really a big surprise, that moved me to tears. It is the most wonderful thing that happened with #LinkingPostcards and I'm sure quite sure, no one will be able to excel this. Now let me present you the #LinkingPostcard Luca, that 5 year old Luca Deegan has created for me. Like many children of his age. "Luca is really into superheroes, so much so that he made up his own SuperLuca, his daddy told me in his handwritten letter. While my partner and I were watching the sunset, I saw this plane just taking off and heading for the sunset, all over the Atlantic Ocean. 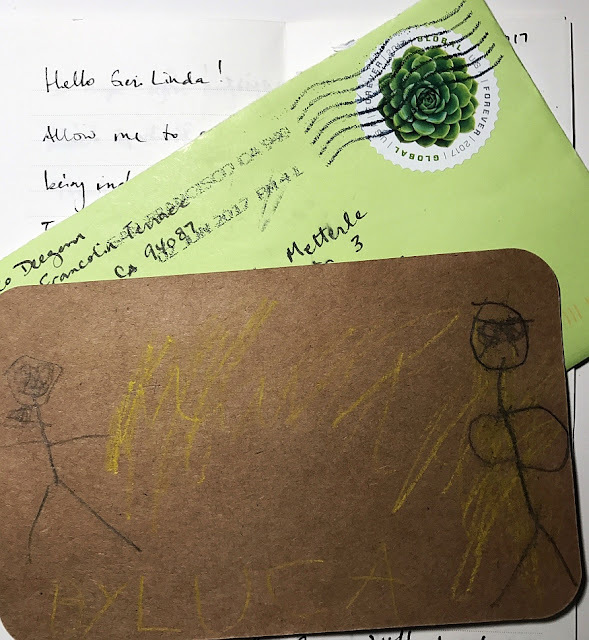 Now the card took the same way heading west and flying all the way through the West Coast of California, where I'm going to be this summer, by the end of August and I really hope to meet the little artist, the youngest participant at the #LinkingPostcards initiative and his little sister Emma of course their parents, too.